They say you can’t take the Southern out of a southern boy. the way to a man’s heart is food. My good ole’ southern husband had no chance against this Chicago deep dish pizza. He has heard of Chicago deep dish pizza. To someone who truly knows Chicago pizza, there are no words that can truly describe it. Now, anyone who knows me is probably looking at this jaws open – That’s not healthy! You know those days when you’re trying to be healthy, so you order the “sweet potato fries” or the “diet coke” with your burger and fries? I have been hunting for a delicious deep dish pizza recipe. I finally found one, but it was with white flour, butter, and corn. 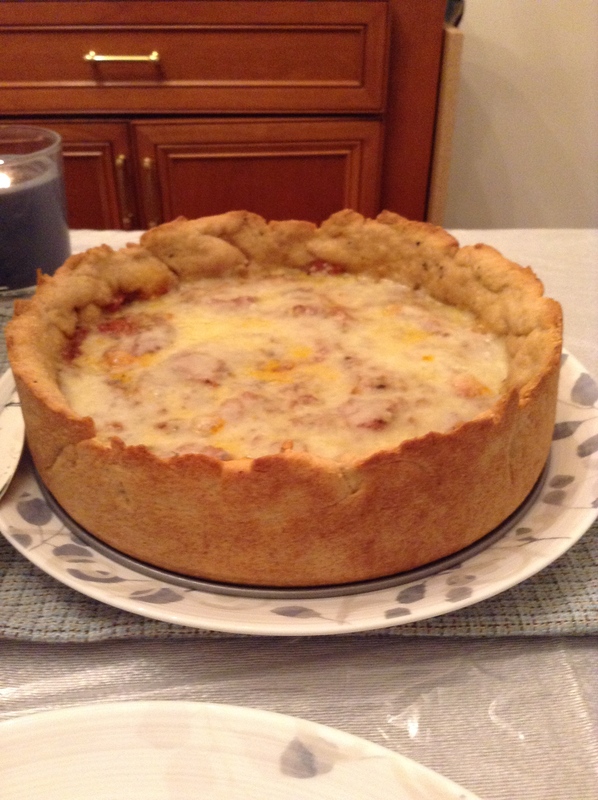 Chicago deep dish pizza challenge for Rosh Chodesh? I used the recipe from Sally’s Baking Addiction with a few changes. 1) I used whole wheat flour instead of the white flour. Since whole wheat absorbs more moisture, I believe it helped the texture that I omitted the corn (see below). 2) No corn in the crust (corn allergy). I tried this twice – once adding in 1/2 cup of flour to make up for it and once leaving it at 3 &1/4 cups. I found leaving out the corn completely was a better result. 3) I used coconut oil instead of butter which not only made it healthier but decreased the amount of dairy in the pizza. We could not believe that the crust was so buttery tasting without actual butter in it. Delicious! 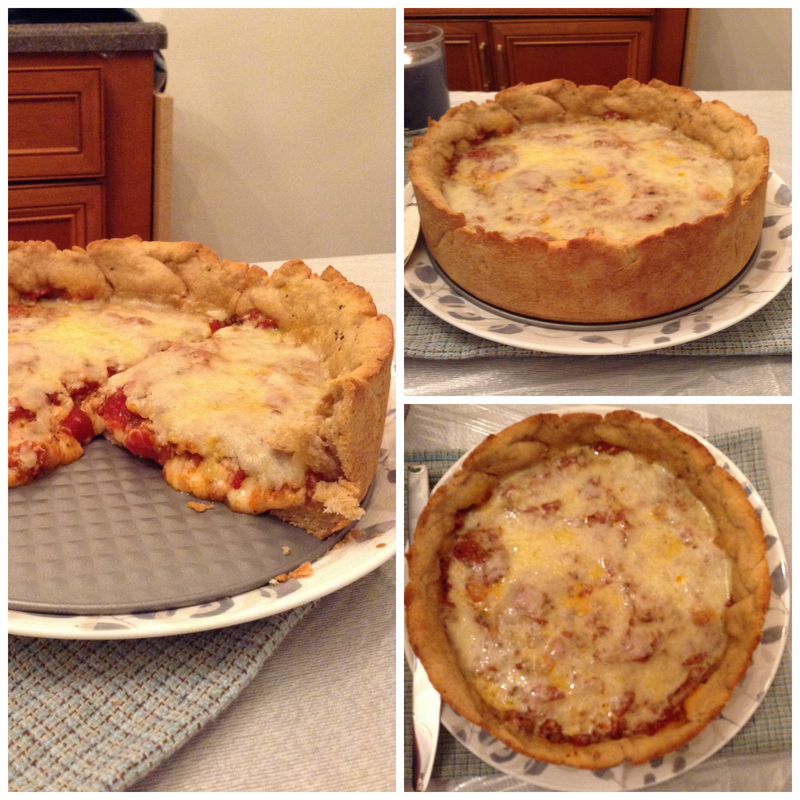 4) I grew up with traditional Chicago Deep Dish, so I went with diced tomatoes instead of crushed (in the sauce) in order to get a chunkier result. I opened up two tabs and kept the recipe open on one and the instructions on the other, so I could keep looking at both. It is time consuming, but this recipe is completely worth it! The changes made it slightly healthier and absolutely delicious! To feeling like a true bred Chicagoan, deep dish pizza and a rainy day. Oh, raesofsunshine, please come out! Yeah! Rae is back and next time save me a slice !!!!!! !